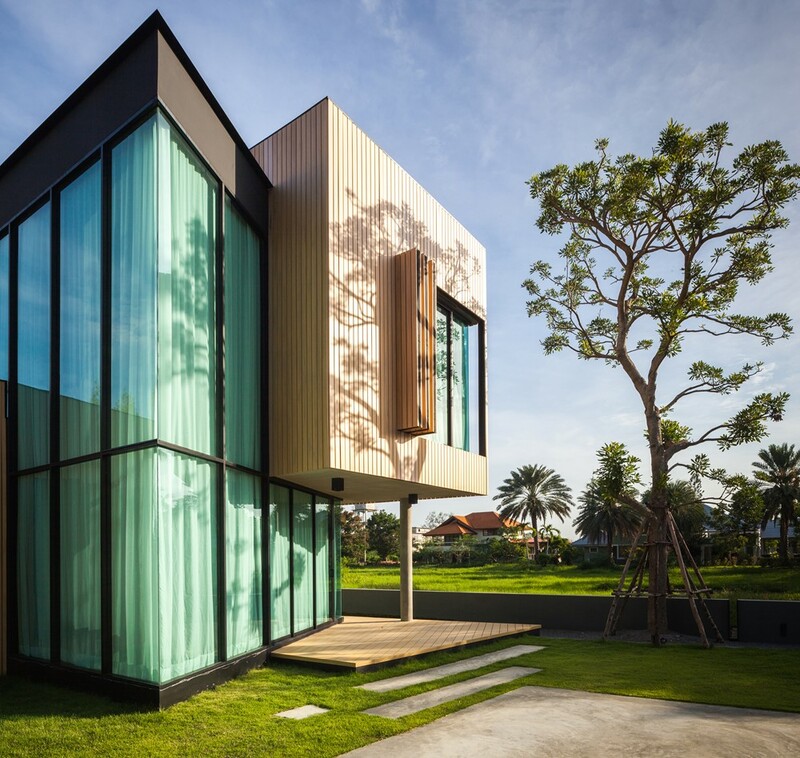 T House is a project designed by IDIN ARCHITECTS, covers an area of 260 sq.m and is located in District Chao Samran Beach, Thailand. T House is the vacation house closed by Chao Samran beach. The house is to serve for the big family vacations. The owner has total four siblings and each has own family with two kids, they are altogether more than ten lives if they spend the time here together on their leisure. 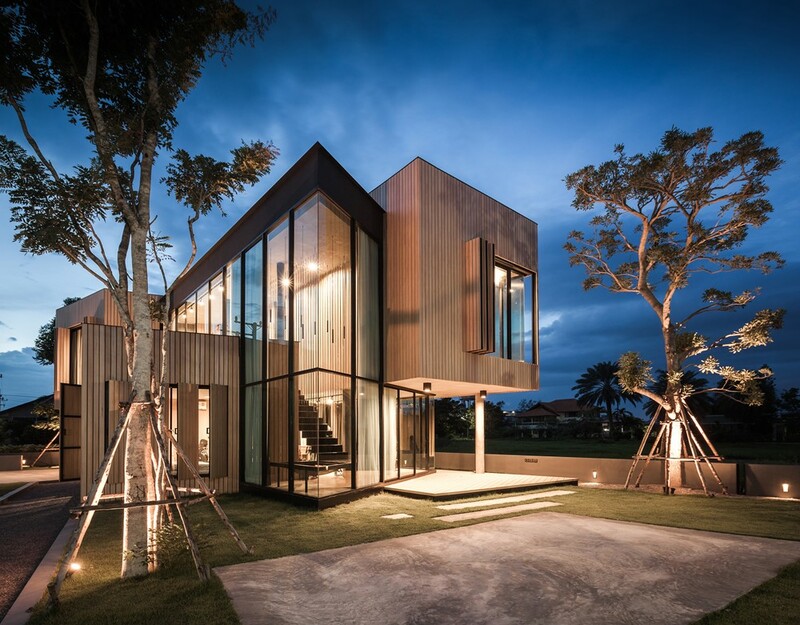 The main function of this house is for a party, dining and resting. The architects designed under the thinking of sharing space. While everyone is doing their own activity in any corner, each can be seen and talk to each other as if they are at the same space. The design begins with layout enclosed space of three master bedrooms, and happens to be the common area at the center which open view to the sea and to non-heat direction at the North. The bedrooms also act as shading that block sunlight from South and West to the main common area. One bedroom on ground floor serve the continuity of living space and also convenient for the elders not to hiking to upstairs. 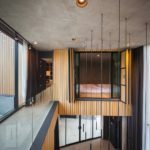 The wall of the three bedrooms are designed enable for fully opened in which the entire area of the house become a single space where the activity flows throughout the house both upper and lower. The materials applied for the bedrooms are wood which lying continuously from inside to outside. On the exterior view, the bedrooms are apparently standing out as three wooden boxes, and they are divided only by the glass which is to control the air flow. The interior considered on the owner’s functions and lifestyles. The dining table is adaptable for multiple uses. The bed rooms serve for many persons staying simultaneously. The rope net at the stairs is for the kids to play around. This entry was posted in bathroom, bedroom, house, kitchen, living and tagged bathroom, bedroom, house, house idea, houseidea, IDIN ARCHITECTS, kitchen, living, myhouseidea, T House, villa on April 27, 2017 by admin.